The art of stand-up comedy meets the art of improvisational comedy. 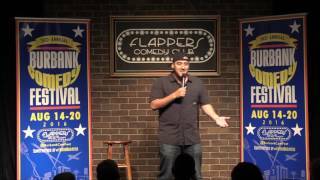 Watch as Orlando’s best stand-up comics try their hand at improvisational comedy in what we call A JOKE OFF. Starting with 8 comics, 2 will be on stage at a time, seeing who can come up with the funniest joke from a topic picked by the audience. After 3 rounds, a winner will be chosen by crowd applause.